A huge arthropod that lived 480 million years ago used spines on its head to filter seawater and to trap tiny particles of food. The lobsterlike animal, six feet long, is one of the earliest giant filter-feeder ever discovered, scientists reported in the journal Nature. “It implies there was a rich source of plankton at the time, upon which these things may have fed,” said Derek Briggs, a paleontologist at Yale University and one of the study’s authors. Dr. Briggs and his colleagues discovered the fossil remains of the new species, named Aegirocassis benmoulae, in Morocco. It belongs to an extinct family of marine animals called anomalocaridids, which first appeared during the Cambrian Period 520 million years ago. 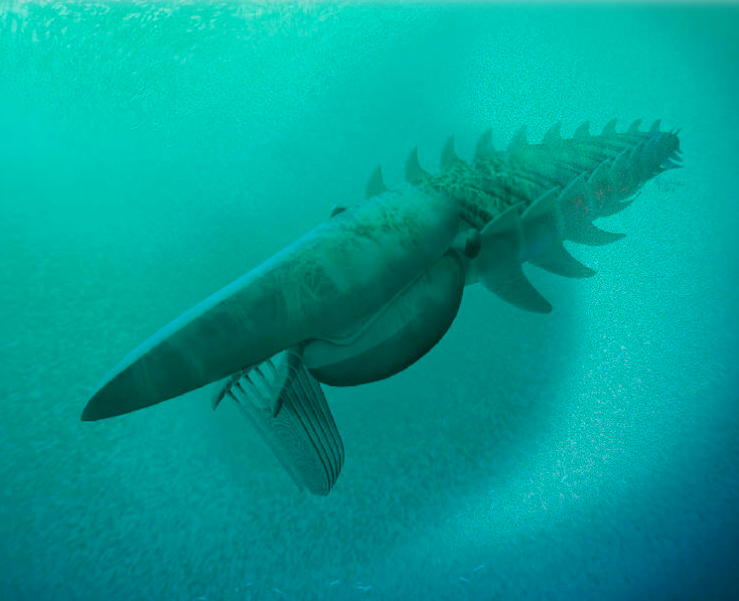 Aegirocassis had double flaps along the side of its body, rather than the single flaps seen in previous anomalocaridid fossils. The bottom flaps may have helped Aegirocassis swim, while the top set of flaps may have been used for stabilization, Dr. Briggs said. The fossil remains are three-dimensional and exceptionally well preserved. Almost all previous anomalocaridid fossils were flat. “We think it is because these things were buried quite rapidly by a storm or other event on the seafloor,” Dr. Briggs said.